Bangkok City Governor Sukhumbhand Paribatra, October 23, 2011. The floods hitting Thailand have so far spared the capital’s central and suburban areas of major flooding. But, the Bangkok city governor Sukhumbhand Paribatra says major inundation is forecast to hit the city by mid-week as a second wave of floodwaters hits the city from the north. During a visit to the city’s outer districts Sunday, Bangkok Governor Sukhumbhand Paribatra said the city’s flood defenses are prepared, but face a new wave of waters now bearing down from the northern provinces of Pathumthani and Ayutthaya. “I think the first overflow has passed Bangkok already," he said. "It is going to the west and east and maybe will bypass Bangkok altogether. But I think the second overflow is three to four times the volume and we are bracing for that. It will coincide two days later with a very high tide. So I think that will be the next difficult moment for us. But who knows water?" 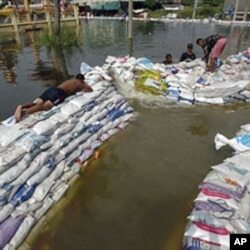 Soldiers use sand bags to build barriers in flooded Pathum Thani province, in Bangkok's suburbs October 20, 2011. In suburban areas of Bangkok, people are hastily building outer brick walls or sandbagging their shops and homes, while hundreds of cars and vehicles have been parked on bridges and inner expressway lanes to save them from rising flood waters. The floods are part of major inundations across Southeast Asia that have claimed more than 700 lives and forced millions from their homes. Thailand’s death toll has reached 356 - including more than 50 children. In Cambodia the toll has reached 247, while flooding has claimed 100 lives in Burma and more than 55 in Vietnam. Sukhumband, a member of the Democrat Party, denied reports of disagreements between the city and national government led by the governing Pheu Thai Party of Prime Minister Yingluck Shinawatra. The prime minister has faced increasing criticism over her government’s handling of the flooding. On Friday, she invoked civil emergency legislation giving her full authority over the flood crisis. “The problems [with the central government] have been exaggerated," he said. " We have cooperated all along, but sometimes it is different agencies that have proved difficult to deal with, for example, Metropolitan Water Works Authority. But that is OK, I am not complaining." The center said more than one-million people have been moved to shelters or had returned home to their native provinces due to the floods. The economic damage continues to mount. Economists estimated the cost of the floods at $6 billion, including the inundation of more than six major industrial estates. Industry Ministry officials say 14,000 factories have been hit by the floods with a loss of more than 600,000 jobs. Migrant workers have also been hard hit, with support groups saying 200,000, mostly from Burma, who largely work in the industrial, agricultural and service industries have lost their employment. Prime Minister Yingluck says it may take up to six weeks for the floods to fully recede. But in a positive development, officials in Nakhon Sawan province, 240-kilometers north of Bangkok, say flood waters have begun to decline by as much as one meter.